Whether you have something to celebrate, or just want to enjoy a stunning and special meal any night of the week, this combination of delights will satisfy! 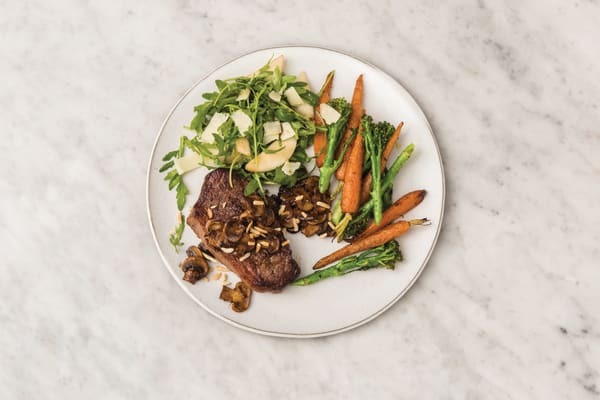 To accompany your tender steak, we have upgraded mushrooms by adding a sweet and tangy balsamic glaze and golden garlic. Plus, the sides are almost as good as the main course, with elegant roasted veggies and a sweet and savoury salad. Get ready to serve up a feast! Preheat the oven to 220°C/200°C fan-forced. Trim the green tops from the Dutch carrots and scrub them clean. 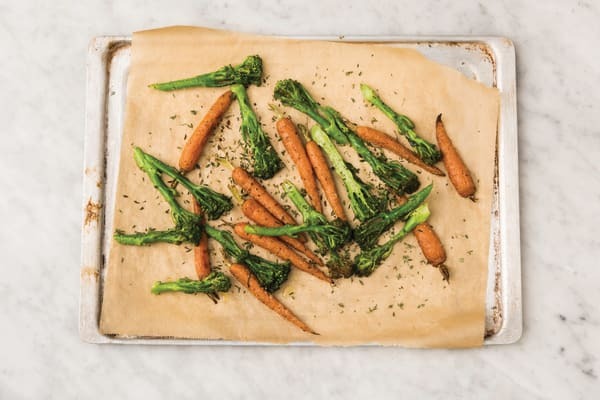 Place the carrots on an oven tray lined with baking paper and drizzle with olive oil. Season with salt and pepper and toss to coat. Arrange in a single layer and roast for 20 minutes. Halve the broccolini lengthways. Pick the thyme leaves. After 20 minutes, remove the tray from the oven and add the broccolini and thyme. Toss to coat and roast for 5-7 minutes, or until tender. While the carrots are roasting, thinly slice the pear. Finely chop the garlic (or use a garlic press). Heat a large frying pan over a medium-high heat. Add the slivered almonds and toast, stirring, for 3-4 minutes, or until golden. Set aside. In a large bowl, combine a drizzle of olive oil and the balsamic vinegar. 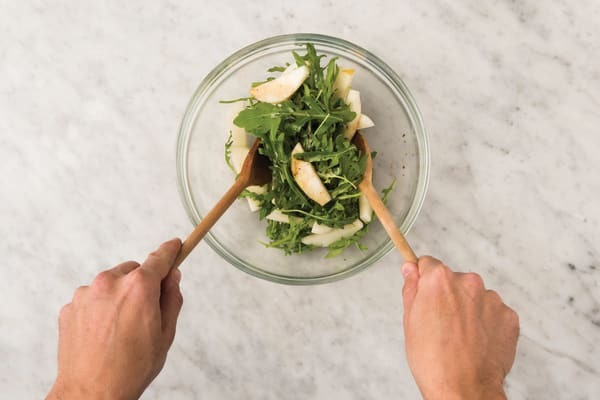 Just before serving, add the pear, rocket leaves and shaved Parmesan cheese. Toss to combine. TIP: Toss the salad just before serving to keep the leaves crisp. 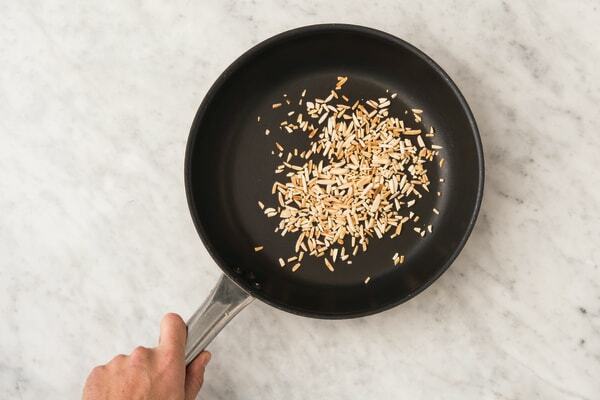 Return the frying pan to a high heat with a drizzle of olive oil. Season the sirloin steaks with salt and pepper on both sides. When the oil is hot, add the steaks to the pan and cook for 2 minutes on each side for medium-rare or until cooked to your liking. Using tongs, sear the fat for 30 seconds or until golden. Transfer to a plate and set aside to rest. Return the frying pan to a medium-high heat with a drizzle of olive oil and the butter. Add the garlic and sliced mushrooms and cook, stirring regularly, for 3-4 minutes, or until browned. Add the balsamic glaze (see ingredients list). Cook, stirring, for 1-2 minutes, or until coated. Season to taste with salt and pepper. TIP: Stir through the steak resting juices for extra flavour! Divide the sirloin steaks between plates. 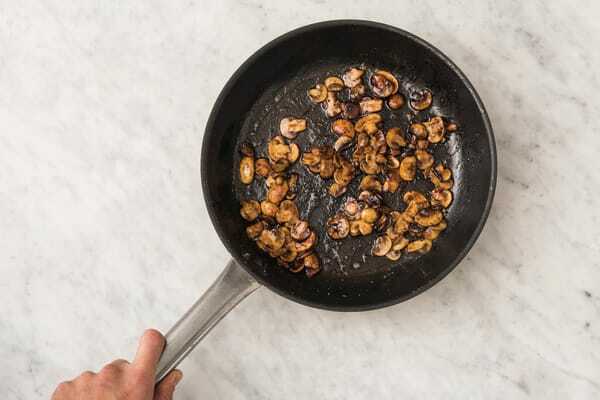 Spoon over the balsamic mushrooms and sprinkle with the slivered almonds. 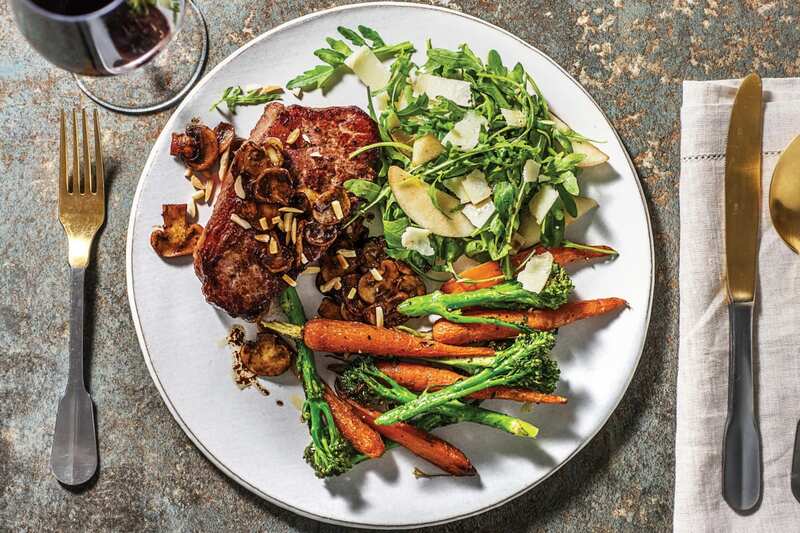 Serve with the thyme-roasted carrots & broccolini and the pear-Parmesan salad.